Grand Theft Auto V is, by my count, roughly six hours away. Are your display drivers ready? If you're an Nvidia owner and haven't updated them since, say, yesterday, you might want to get on it: A new "GeForce Game Ready Driver for Grand Theft Auto V" is now available. 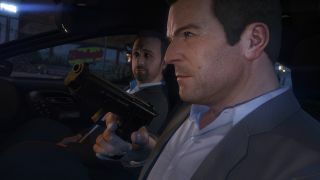 "Just in time for the highly anticipated title Grand Theft Auto V, this new GeForce Game Ready driver ensures you'll have the best possible gaming experience," Nvidia wrote. "With support for GeForce SLI technology and one-click game setting optimizations within GeForce Experience, you'll have the best possible performance and image quality during gameplay." More technical details are available in the release notes. Grand Theft Auto V goes live at 12:00 BST, which translates to 7 pm Eastern, 4 pm Pacific, and other time zones as broken down in this pleasantly precise launch schedule. While you wait, be sure to have a look at the PC-exclusive GTA 5 video editor, and find out why Shaun think it's the game's "killer feature."